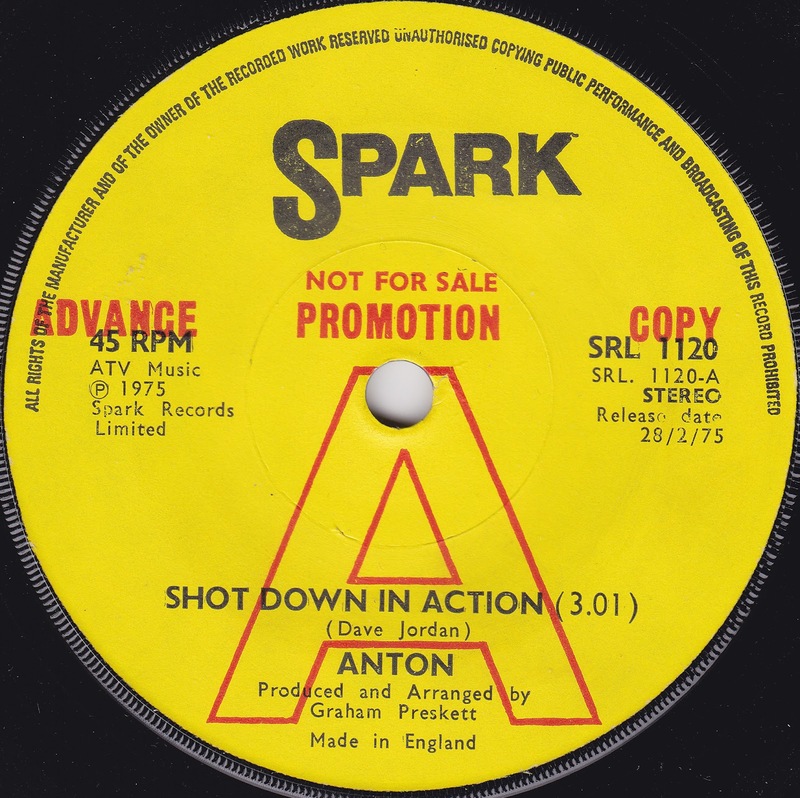 It really does seem as if the vast majority of Spark's output throughout the sixties and seventies sold a few hundred copies (if, in some cases, even that) before being melted down. Their catalogue is littered with surprisingly good little singles which are astonishingly difficult to track down copies of now, and here's another example. "Shot Down In Action" is a piece of dramatic seventies glam pop with a pounding intro, chiming piano lines, and an excess of drama. It's strident, catchy, flamboyant and has a surprisingly ambitious arrangement for a song of its type - this is no bonehead cruncher. If it's guilty of anything at all, it's perhaps being a little bit past its sell-by date by 1975, just as the spotlights were starting to dim on anything with a vaguely glam sound. 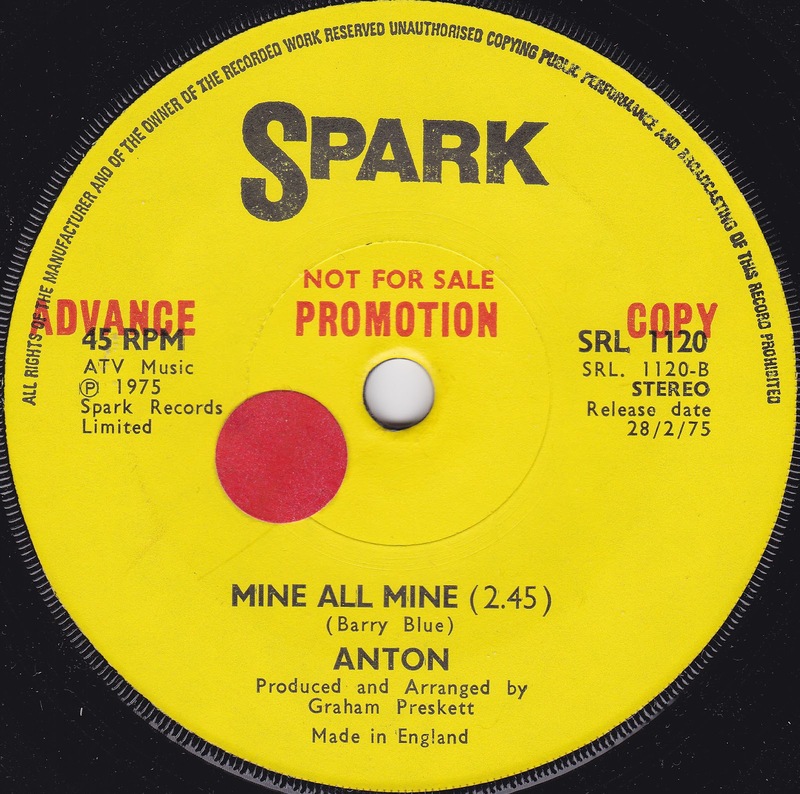 The flip "Mine All Mine" is a rather bland Barry Blue penned ballad, and not worth getting fussed about. Anton appears to have been Anton Johnson, a man who later issued a cover of the deathless "Hey Baby" on Laser Records in 1980, though he failed to find the success with it that DJ Otzi later achieved. If anyone has any additional information, please let me know.